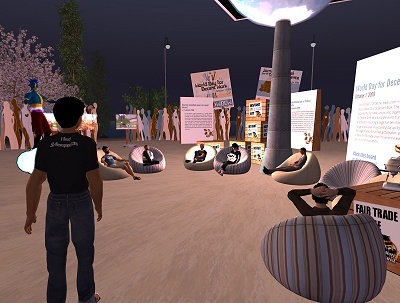 We will be wearing sandwich banners on our avatars and passing on note cards in Second Life on October 7th. …so we can give you the equipment! 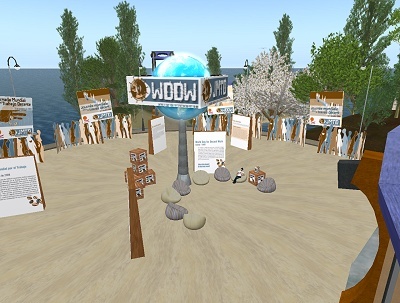 And join us then, October 7th from 6 AM to 8 AM SLT (2-4 PM London UK time) to meet on Union Island and then head off to distribute note cards everywhere! It’s the UK union movement’s annual convention this week, in Brighton on the UK’s south coast. TUC Congress is the policy making body for the Trade Union Congress, and sets the priorities for the union movement’s work over the coming year. 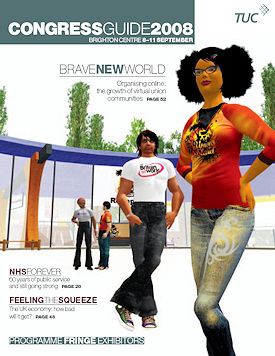 This year, there’s a focus on online organising, with a fringe meeting on Web 2.0 and unions, promotions for new communities for different groups of union stakeholders (including Union Island), and a makeover for the Congress Guide – the magazine format programme of business that all attendees use. We were able to stage a little photoshoot on Union Plaza. The buildings designed for us by Matthaios Aquacade of Citrus Virtual make a very nice backdrop, but the stars are some of our users – Many thanks to our glamorous models for helping out! 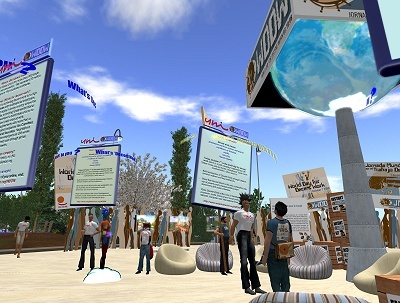 Here’s an SL PR video that Draxtor Despres made for the multi-national employment agency Manpower, about business use of virtual worlds (thanks to Draxtor for sharing with us). 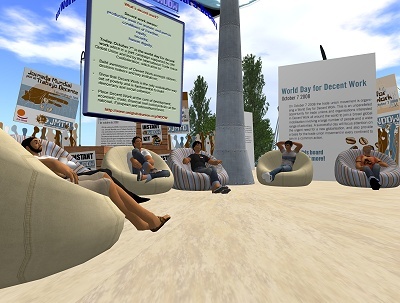 Manpower are a signatory company to the UN Global Compact, a voluntary framework for businesses to measure themselves against a set of minimum standards of decent corporate behaviour internationally, and the video “The Power of Collaboration” discusses issues around corporate social responsibility in the real world and in SL, from Manpower’s perspective.